The open BPSim specification provides a rich set of material on how to configure and assign resources to activities/tasks, how to raise events, decision making and other real-world capabilities. Once configured according to the BPSim specification, a business process model (constructed in BPMN) can be sent to a suitable BPSim simulation engine and run according to the process defined in the BPMN model, using the configuration data attached in the BPSim information. The BPSim specification is very detailed and offers the interested modeler and business strategist an unprecedented flexibility in assigning operating information to a model and then assessing the quality of the solution based on information received back from the Simulation engine. This section describes in detail the various screens and options available when configuring a model for BPSim execution. Sparx Systems provide a BPSim-capable simulator (for separate purchase) - the MDG BPSim Execution Engine. 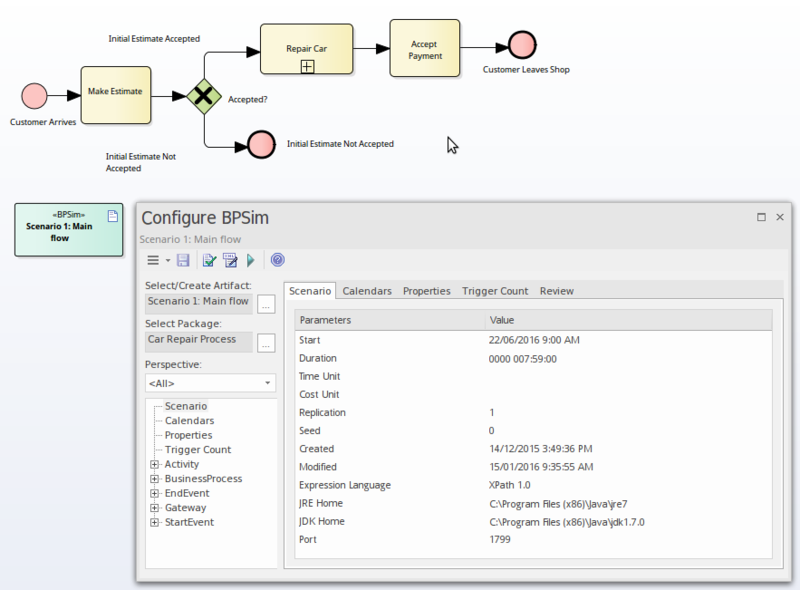 This Add-In integrates with the BPSim and BPMN models defined in Enterprise Architect, providing the capability to run and store the results from multiple simulations and to perform convenient comparisons across each configuration's result set. Installing the Sparx Systems MDG BPSim Execution Engine and registering the licence for it are pre-requisites for accessing and using the built-in BPSim configuration facilities. Once you have set up a BPSim configuration, you can export the BPMN model along with its BPSim data in a standard form that can be consumed by the Sparx Systems BPSim Execution Engine and by any other standards-compliant BPSim engines. You can purchase and download the MDG BPSim Execution Engine from the 'Products' page of the Sparx Systems website (sparxsystems.com/products). As part of this process, you will receive a registration key by email, to enable you to use the system beyond a 14-day trial period. The MDG BPSim Execution Engine installer does not include JRE or JDK, therefore you must install JRE version 1.7 or higher to use the simulation and, if your BPSim Configuration contains any property parameters, you must also install JDK version 1.7 or higher. Click on the Windows 'Start' icon and select the 'Computer' option. From the banner menu, select the 'System properties' option. From the side panel, select the 'Advanced system settings' option. On the 'Advanced' tab of the 'System Properties' dialog, click on the Environment Variables button. On the 'Environment Variables' dialog, in the 'System variables' panel, click on the New button. You must re-start your machine for the new variables to take effect.